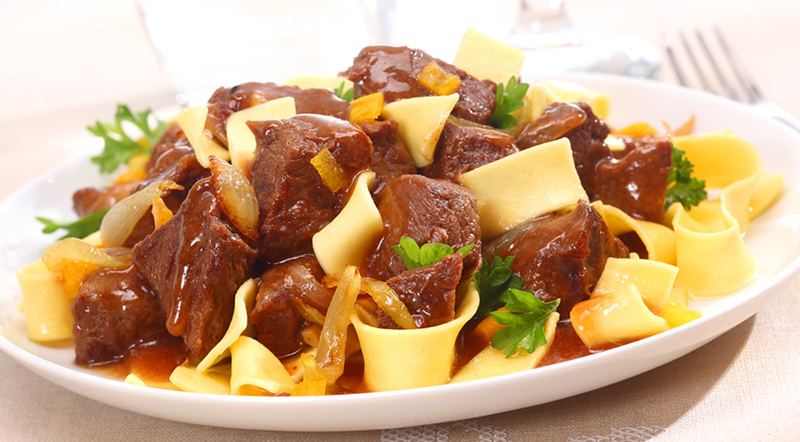 This Austrian beef stew with paprika and caraway seeds is a standard in Salzburg pubs and Viennese coffeehouses. Served over noodles or potatoes, it’s hearty, warm and filling and will surely be a favorite during cold winter months. Heat 5 T of oil in a medium pot and sauté onion and garlic on med heat until golden brown, stirring occasionally to ensure garlic does not burn. In a second pan, heat remaining oil and sauté meat in small batches until browned well. Add meat to onion and garlic mixture. Finely chop cornichons and lemon peel, and add with all remaining ingredients to meat and onion mixture. Stir well to blend; bring to a boil then turn down heat to a low simmer and cook, stirring occasionally for 3 hours or until meat is tender. If needed, add a bit more beef stock. Before serving, adjust seasoning with additional salt and pepper as needed and remove bay leaves. Serve over wide egg noodles, dumplings or potatoes, or with a dollop of sour cream.